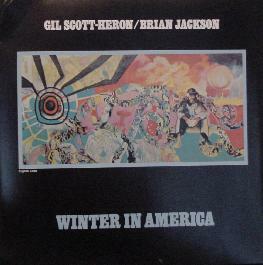 Gil Scott Heron - "Winter In America"
Those us who were involved in the music and politics of the later 60s/early 70s fondly remember how many musical worlds could interact and produce interesting combinations as well as introducing highly talented musicians to wider audiences, and giving inspiring or provocative commentary on human conditions and struggles. Gil Scott Heron came to the attention of many in the early 1970s. He, along with the Last Poets, and Swamp Dog, tried to further the interface between poetry and music that had been hinted at by groups like the FUGS and Nina Simone, as well as writers like Alan Ginsberg, Neil Cassidy and Bob Schwartz. After a first LP (which featured the infamous burn-burner "The Revolution Will Not be Televised"), Gil began a Decade-long association with Washington DC Keyboardist Brian Jackson. "Winter In America" was their second work together, issued by the Artist-Run "Strata-East" (located in Brooklyn NYC.) in the Fall of 1973. The main focus here musically is Gil Scott's husky Tenor, which functions as a horn would, whilst a sparse backdrop to this formidable sound is provided by Jackson, Drummer Bob Adams, and BassGuitarist Danny Bowens. The standout tunes on this LP are Classics: "The Bottle" is a Blues dealing with the devastation Alcohol and Drugs wreak upon the Black Community. The tune swings with a real subtlety and Jackson's Piano work is quite strong and impressive. He never overpowers or clouds the vocalist. "H2Ogate Blues" is an example of placing blame where it's due. In the years before he resigned, now-disgraced President Richard Nixon had declared War upon the resurgent American Left (often with deadly results), advocates of Black Power, Women's and (as yet to be named) Greens. Gil Scott here details just a few of Nixon's abuses, and heaps tons of scorn and derision upon "King Richard". The texture of the voice here is marvelous; his influence over rappers like Chuck D (Public Enemy), KRS-One and Ice Cube cannot be disputed, as Gil spits on Nixon's power obsession (Note: This writer is a former Sixties radical who found Nixon Abhorrent, and who now advocates indicting Henry Kissinger for crimes against humanity!). Throughout, the Rhythm section works with the vocal, allowing Gil to do his poetry riffs without straining. Ironically, the tune WINTER IN AMERICA doesn't appear on this LP, but shows up on Gil's next LP ("From South Africa To South Carolina"), released in mid 1974. Throughout the 1970s Gil's musical/political outlook progressed on fine LPs like "BRIDGES", SECRETS and MOVING TARGETS. Kudos to Get Back for the beautiful reissue (on 180 Gram Vinyl) on this seminal LP, and for an obvious interest in varied forms of African American Music. Most Recent news: Gil Scott Heron was arrested last month (6/01) in NYC, during a raid on an Uptown Crackhouse! According to his spouse, Gil became hooked in the early 1990s and still struggles with addiction, brought about (according to her) by the lack of interest in Gil's work, and his inability to get a recording contract! This is both a tragedy and an absurdity. It would be to the Rap/Poets community benefit to recognize his input, and honor his work!